Create a continuous color palette for your home’s exterior. You should choose a roof color that goes well with the sidewalk or pavement. This pulls the shingles to ground level and creates an identical vibe. Metal roofs with vertical seams push the eye outward, creating the illusion of a larger landscape. Dark-toned roofs work well with ornamental grass with pink, green, blue, and orange hues. They also look best when contrasted against light-toned siding. If you have seasonal foliage like hydrangeas, then opt for orange or brown roofs. You can also base the color of your Munster roofing on surrounding flowers or shrubs to create a seamless connection. Shingles and tiles come in different textures that you can incorporate into your landscaping. For example, you can pair colored roof tiles with a brick sidewalk for a great home-garden bond. 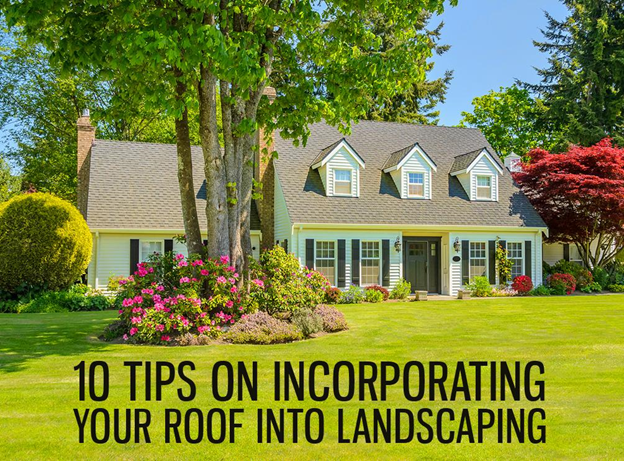 You should base your roof’s color and texture on the plants closest to your home. You can accentuate vertical seams with tall trees. For a clean exterior look, choose a roof shape or direction that is the same as your siding and outdoor recreational spaces. For example, if you have horizontal siding, opt for the same-shaped roof. Don’t be afraid to accentuate your roof’s color or texture using decors like boulders, sculptures, and fixtures. With these tips, you can have a better-looking home with a higher property value. Let Rogers Roofing help you with your home improvement project. For high-quality Dyer roofing, you can choose from our concrete tiles, CertainTeed asphalt shingles, and Gerard® stone-coated steel. As certified dealers of the top roofing brands, we carry their strong warranties for your peace of mind. For more roofing tips from the pros, give us a call today. Indiana homeowners can reach us at (219) 228-8210; for Illinois homeowners, at (773) 492-2270. You can also request for a free quote by filling out our contact form.